Judith Torrea is a Spanish journalist living in Ciudad Juárez, Mexico, a city devastated by battles between drug cartels and the “war” that President Felipe Calderon declared against them in 2008. Ciudad Juárez has been called one of the most violent places in the world: between 6 and 27 people are killed there each day. “The danger there is to be alive,” Torrea told Sampsonia Way via e-mail. Every time Torrea opens her mouth or writes a story, you wonder which one of her many targets would like to silence her. “The Mexican President, Felipe Calderon, and the army are not fighting a war against drug trafficking. They are supporting the Sinaloa Cartel and its head, ‘El Chapo’ Guzman, to defeat the Juárez Cartel,” she says while looking directly into the cameras of a Spanish TV program. Torrea, 37, covers the devastation of the drug war on the ground from Ciudad Juárez with her blog Juárez en la Sombra del Narcotráfico (Juárez Under the Shadow of Drug Trafficking), which won the 2011 Best of Blogs Award (the Oscars of the blogs) in the Reporters Without Borders category. She also received the Ortega y Gasset’s digital journalist award from the Spanish newspaper El País, the highest recognition for Spanish-language journalists. This reporter, standing 6 feet, 2 inches tall, is from Pamplona, a city in the north of Spain where a single murder is front-page news for a whole month. Now, living in Juárez, she covers at least 6 murders every day. Why did Torrea end up in Ciudad Juárez? Why did she leave New York City to report from a place where more than 30 journalists have been killed or have disappeared over the past three years? In 1997, she took a sabbatical from her post at Euronews TV, in Lyon, France and moved to Austin, Texas to work with the Texas Observer. Six months later, the Spanish news agency EFE hired her to cover the American Southwest. Death became one of the main themes of Torrea’s reporting when she covered the policies of Texas’ then-Gov. George W. Bush, who presided over more death penalty executions than any other governor in recent United States history. She ended up interviewing many prisoners sentenced to death, along with their relatives and the authorities. “If you are rich, you can avoid the death penalty in the United States. If you don’t have the money, you can’t save yourself from lethal injection,” she then reported. Torrea didn’t feel she could thoroughly understand her subject until she attended an execution: she became the first Spanish reporter to witness an execution in the United States. Three years later Torrea published an exclusive interview with one of executioners who said he regretted his participation. She also reported on death from the other side of the border. One week after she arrived in Texas, she visited Juárez for the first time and reported on the poor young women—women younger than her—who were being killed in a series of femicides that are still going on today. During that time, Torrea fell in love with the people of Juárez. “Its inhabitants are optimistic and hard workers. They see life as a fantastic instant that can end at any moment,” she said. Since then, she would return periodically to live there and continue her reporting on other issues. The inhabitants of Ciudad Juárez were on her mind even after she moved to New York City in 2007 as a political reporter and joined the exclusive group of journalists in Mayor Michael Bloomberg’s daily press corps. She later became a senior writer for the Spanish edition of People Magazine, but still traveled to Juárez every other month as an independent journalist. While trailing contemporary celebrities for a publication interested in gossip, controversial quotes, and fashion, she saw connections between celebrity culture and Ciudad Juárez. “In New York I used to go to celebrities’ parties, where people consumed the cocaine trafficked on the Mexican border. The United States produces the most consumers –and guns–and Juárez the most corpses,” she pointed out. Despite the fact that many of her former sources were in coffins and that 116,000 houses had been abandoned after a massive civilian exodus to El Paso, Texas (the second safest city in the United States), Torrea doesn’t plan to leave. She remains the only international journalist living in Juárez. Torrea wakes up at 5:50 a.m., reads the newspapers, and leaves her home at 7:00 a.m. to start her daily reporting. Until few months ago, she used to tune into the local police scanner to track what was going on in the city. It was no surprise to Torrea that she and her colleagues were the first to arrive at the crime scene, even before the police. “The queerest fact was that the scanner was really easy to access and the drug traffickers used it as well. If one cartel wanted to celebrate a killing, it interrupted the scanner signal with narcocorridos—songs lauding the drug traffickers that evolved out of the traditional folk ballads,” Judith said. The police scanner was finally changed, but Torrea and her colleagues still arrive to the crime scene before the police most of the time. “I know about the murders thanks to my sources, but sometimes I’ll just discover other dead body is in the road while I’m driving,” Torrea added. Every day Torrea travels long distances to interview people and post their stories on her blog or in one of the international newspapers and magazines that she contributes to. While Ciudad Juárez’s local newspapers cover the daily news with headlines like “Three Severed Heads Discovered in Ice Boxes,” Torrea uses people’s testimonies to show what causes the violence and its effects on people’s lives. In Ciudad Juárez , 17,000 teenagers belong to gangs and 10,000 children have become orphans. One of her profiles focuses on the mother of two murdered students, who confronted President Calderon at a public event. “Excuse me Mister President, I won’t shake hands with you. You said that my sons were gang members and that is a lie. My youngest son was in high school and the oldest was in the university. They were only students,” the mother stated. After attending the two boys’ funeral and interviewing the mother, Torrea published an article vindicating the mother’s story and showing that the president’s allegations were false. In her blog Torrea also describes complex characters such as a soldier who robs to eat, a confessed murderer who is free, and a chief of police who lived inside a jail for security reasons and just weeks ago was killed with his son. Torrea, the independent outsider, also writes about murdered journalists and lawyers, as well as the doctors who continue to care for the victims of violence despite the fear of consequences of aiding an enemy of one of the cartels. “My blog came out of a need to tell the victims’ stories without censorship because in Juárez there is no freedom of speech,” she explained. 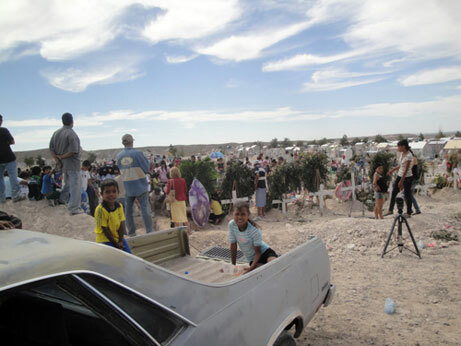 In Juárez, the local media fear reprisal from drug traffickers or corrupt authorities. Torrea’s blog is not sponsored by any institution. Her only income comes from her sporadic assignments from international newspapers and magazines. “My blog is free; it doesn’t have any funding and I need freelance commissions to eat and pay my bills,” she explained. Thanks to her publications, her name shows up all over the Internet. Each day, she receives dozens of e-mails from journalists who want to interview her, researchers who want the contact information of her sources, and readers who want to show their support. “I answer everybody, but not immediately. If I do that, I won’t have time to do my work,” she said. By speaking out, these mothers—and Torrea’s other sources—could be making enemies among corrupt authorities or cartel members. These criminals might feel attacked when Torrea’s sources’ quotes—and sometimes pictures—pop up on Juárez en la Sombra del Narcotrafico. Even though she doesn’t say it, Torrea could easily be labeled as an enemy as well. 2 Comments on "Judith Torrea: Under The Shadow Of Drug Trafficking"